Yes! 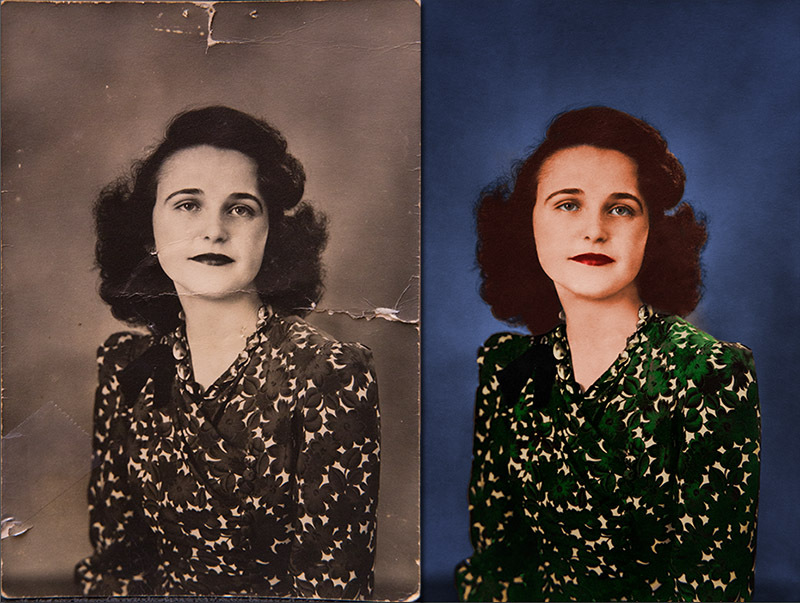 I offer photograph restoration services. Do you have an old photograph that is damaged? water stained? torn? scratched? portions of the image gone?? I can fix that! I treat your image with the utmost care, and strive to produce a faithful restoration that you may enjoy for many more years! Even if it is an image that you feel is "unfixable", feel free to contact me and we can talk about it, and line up a time to bring it by my studio, and we can assess what can be done to restore it. Your original damaged print can be of any size and condition. 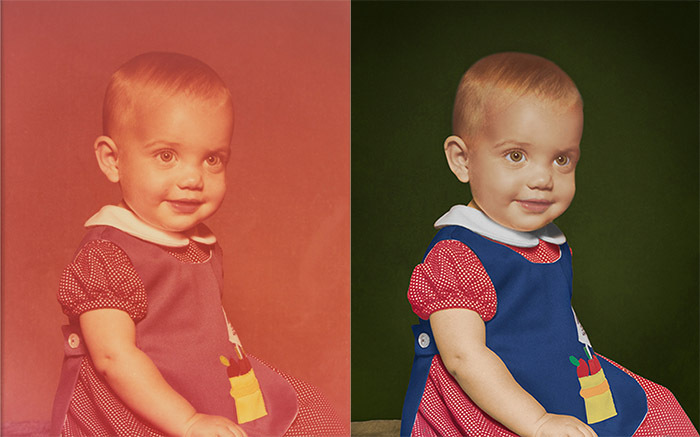 I use all-digital photo restoration and reproduction techniques and ensure your original image will not be damaged in the process. "Thank you so much for restoring my fathers photo that was made in Germany during WWII. Over the years it has become fragile in the frame as well as turned darker and yellowed. Your attention to detail, especially the color of his eyes, has made the photo such a great reminder of the way he looked. My mom will be so surprised! I highly recommend you, Mr. Gourley. You were so careful with the original while removing it from the frame with my assistance. You carefully inspected it for trouble spots that would need correcting and gave me a quote. Over the next few days you emailed me proofs of how it was coming along and asked for details as you perfected it. I was not in a hurry to have this completed but you had it ready very quickly. I am so happy with the end result. The flaws are no longer there, the yellowing is gone, and the true colors on the era are there. Thank you so much! - Sincerely, Mel Pahl"
"Kevin went to great lengths to restore a heavily damaged family photograph, and the results were spectacular. Just as impressive as his work was his service—he was highly accommodating, kind, understanding, and articulate. I cannot imagine a better customer experience and I highly recommend him." 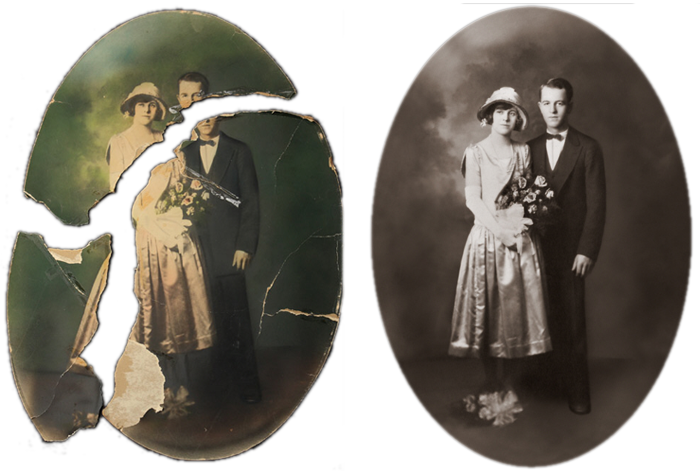 "I had an old family photograph that was heavily damaged by water and then was torn when I removed it from the frame. Kevin did an amazing job at restoring the image. I am so grateful I found him." 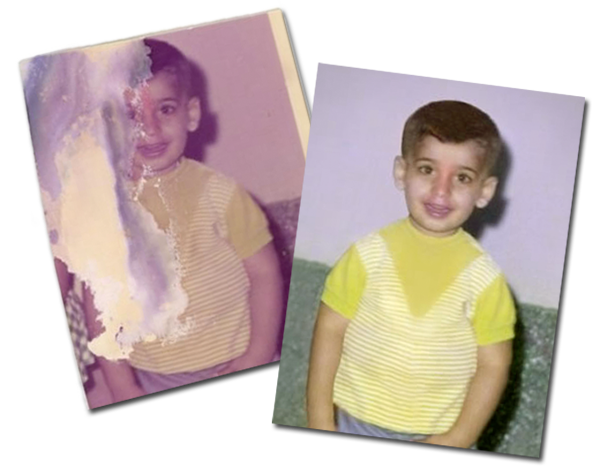 "I wanted to let you know that the photo restorations you did were an overwhelming surprise for my family. They are still marveling at your work. As I shared, we didn't have a lot of photos of our parents and the one of us as kids was recalled only by my brother and he was 7 years old, at the time. I wanted to again thank you for your professional services and let you know how much it meant to me and my family. You not only restored photos, but you also restored a big part of the our hearts. Have a great year and if we find any more family photos...I know where to find you." Contact me to arrange a meeting to assess your photograph's damage so that I can make a better estimate of what is required to restore it. Once your image has been converted to digital format and restored, I can provide the image via email as a JPG file or on CD, or I can provide ultra premium luster prints or beautiful canvas prints at my standard print pricing. Prints or Canvas: Ultra premium luster prints range from $10 up to $200. Beautiful canvas prints range from $150 and up.